There’s only been one post in this series in the past year, but for impact speakers, this book is real news. Best advice on how to have an impact I’ve ever seen. Not perfect IMO, but full of things I bet you’ve never thought about that can really help you up your game. By “impact speaker” I mean a speaker who really wants to grab the audience’s thinking and have an impact. That’s not the only valid kind of speaking, and it’s certainly not the only valid way to tell your patient story. But if you, like me, truly want to change the world, it’s really useful to get people’s attention. And this book makes clear that how you go about it can make a big difference. Buy a copy for any Speaker Academy visitor (you) who can convince me they want it for good reason. The author is Chris Anderson @chr1sa, founder of TED. When I first heard about the book I thought it might be some light fluffy cheerleading: “You can do it! Just be yourself!” Instead, it’s absolutely full of “This is what works,” “Do this; do NOT do that,” often including examples like “You might have done it this way:” followed by “But see how much better it is if it’s done this way?” Most points are accompanied by example TED Talks you can watch, and in the Kindle version those talks are even linked. I’m halfway through the book and already I’ve found things I know I do (“conscious competence”) that nobody else talks about, things I do that work that I didn’t realize I was doing (“unconscious competence”), and a bunch of things I never thought of – different ways to structure a talk, different types of compelling talks, etc. The impact on me is strong enough that I’ve stopped a project I was working on, to rethink it after I finish the book. Mind you: this is not the only way to be a speaker, and I don’t agree with everything he says. For instance, he strongly prefers full scripting and rehearsing your talk, despite also saying that if you’re not good at it, you look awkward and boring. I know people who’ve tried that … yet, he also says the most important thing is to be yourself, and cites several things that used to be firm requirements but which they’ve realized don’t work for everyone. Good. But if you’re a speaker who wants to up his/her game, so you can have more impact on audiences’ minds and imaginations and outlooks, I strongly recommend this book. Even if you don’t do everything it recommends, you’re guaranteed to expand your awareness of how to be an engaging speaker. What do you talk about, usually, in healthcare? Why do you want the book? Please answer this from the heart. I ask these questions to start the thought process that will continue in the book. It’s up to you not to be boring. I don’t mean that to be harsh, but it’s true. Have you ever heard a talk that’s so bad that you spend your time doing email? Well, the great Kaiser doc @TedEytan sometimes starts a talk by saying “I don’t mind if you want to do email while I’m talking, because it’s my job to be more interesting than your email.” That is taking responsibility for your audience’s experience. Happily, there are things you can learn that shed light on how to do that, and that’s what’s in this book. I read this a few months ago and also found it valuable, tho I speak only 1-2x/year these days. I too stumbled upon similar techniques when designing and rehearsing my TEDx talk of May 2013. I agree with Chris on the need for rehearsal — but the TED genre is *very* different than the typical speaking engagement. It’s performance, and I at least needed to get to the memorization phase in order to emerge past it into normally, being myself. Then, I could be myself on a higher plane, knowing I would not, during those 20 minutes, ever stand there saying “um…”. Your number-one mission as a speaker is to take something that matters deeply to you and to rebuild it inside the minds of your listeners. We’ll call that something an idea. Anderson, Chris (2016-05-03). 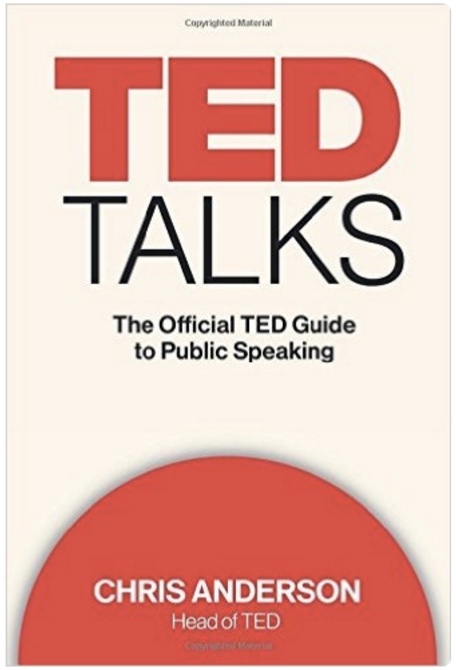 TED Talks: The Official TED Guide to Public Speaking (Kindle Locations 259-260). Houghton Mifflin Harcourt. Kindle Edition.